Capturing an aerial picture of Kakabeka Falls Provincial Park, also known as the Niagara of the North, is spectacular as you can see how massive the falls are as the water crashes over the rock ledge, 40 meters down into the pool. The Kaministiquia River has carved its way through these canyon walls for hundreds of years making these falls the second largest in the world next to Niagara Falls. 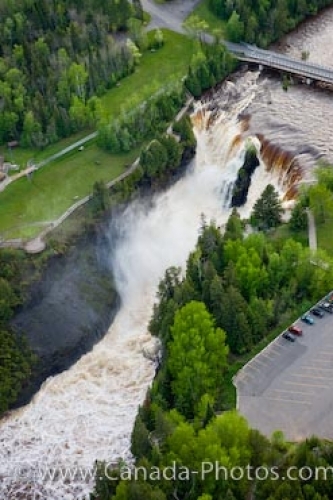 Aerial of the rushing water of Kakabeka Falls in Thunder Bay, Ontario in Canada. Aerial view of the Kaministiquia River and Kakabeka Falls at the Kakabeka Falls Provincial Park, near Thunder Bay, Ontario, Canada.